When freight rates are terrible, even a slight improvement seems like an uptick. But a terrible market is still a terrible market. Capesize rates have marginally, slightly, improved… but they’re still dreadful. And the rest of the dry bulk shipping markets are doing their best to impersonate a submarine… they’re all steadily sinking. 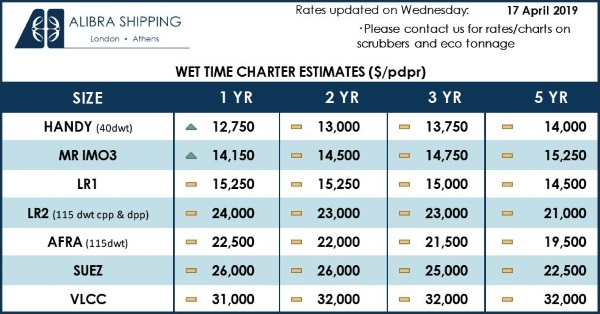 In the latest Weekly Scope from Braemar ACM Shipbrokers, their dry bulk specialists note there was a “slight improvement” in the Pacific this week for capesize vessels. A capesize ship is one that is at least 100,000 deadweight (dwt) although definitions vary from source to source. Industry consensus is that the a typically sized capesize is about 150,000 dwt. At the big Australian iron ore export ports of Dampier, Walcott and Hedland, the range is typically from about 100,000 dwt to to about 200,000 dwt, with many berthed ships at about 180,000 dwt. Although Hedland, in particular, can take very large vessels including behemoths of 260,000 dwt. Deadweight is a measure of the weight-carrying capacity of a ship expressed in metric tons. A metric ton equals 2,204.6 U.S. pounds. Braemar ACM notes that freight rates for a 180,000 deadweight capesize increased by US$872 (all financial figures will be in U.S. dollars), from $3,513 per day to $4,238/day on the Australia-north Asia routes. That’s just under a 25 percent increase. But that’s still not good. Far from it. “Overall the capesize market has been awful. Since September or so of 2018 the market has been absolutely hopeless for both capesize and panamaxes,” says Jayendu Krishna, a Singapore-based director with international consultants Drewry Maritime Advisors. “Earnings are now about $4,000/day for a 172,000 to 180,000 deadweight capesize. But that is still below the operating cost of about $7,000 to $8,000/day,” he explained FreightWaves. That kind of discrepancy between daily earnings and costs is not, of course, sustainable. That said, ship operators might be able to run that kind of deficit for a few weeks, maybe even a couple of months. Especially because they had good earnings until just before the final quarter of 2018. “Back in September , some operators were earning $25,000/day in the spot markets. So operators may have some cushion,” Krishna said. Capesize and panamax rates have collapsed for three main reasons, Krishna said. The dam disaster in Brazil was one reason. Adverse sentiment generated by the U.S. and China trade dispute was another. Disruption in Western Australia is a third. Breakwave Advisors, which manages the Breakwave Dry Bulk Shipping Exchange Traded Fund, wrote in its most recent update that the situation on the ground in Brazil remains “very uncertain.” Breakwaves Advisors estimates a more aggressive total loss of production/exports than the Brazilian miner Vale does. It expects a loss of production of about 100 million metric tons. Accordingly, Breakwaves Advisors is not optimistic about capesize recovery rates and the fund advisor noted that capesize spot rates (average) stand at 8,740 points, which is down 32.6 percent from last year. Norwegian broker Fearnleys was slightly more optimistic in its most recent note for the capesize markets. Athough it noted “overall disappointing returns and poor freight levels” it pointed toward a positive trend of the market inching up”. A removal of ships from the Atlantic market contributed to a “relatively big increase” in the fonthaul rates, Fearnleys said. Rates for panamax vessels weren’t great this week either, according to Braemar. A 74,000 deadweight panamax the week before last went for about $7,310/day but that rate dropped last week to $6,896, down by $414/day on the Australian Round Voyage. And the reason? Lots of ships and little in the way of cargo, Braemar says. North Pacific cargoes were flat, Braemar added. A likely rate-depressing factor in the Pacific is that it is a coal-driven market and China’s coal imports are “subdued” according to Breakwaves Advisors. The advisory company notes that Panamax spot rates (average) stand at 7,007 points, down 39.2 percent year-on-year. Fearnleys noted that rates were down around the globe following a couple of strong weeks. But, on the brighter side, Fearnleys forecasts a recovery owing to a larger quantity of cargoes entering the market. In the smaller end of the dry bulk ship size range, Braemar added that the markets continued to slide. On the Australian round voyage to southeast Asia (ship sizes 28,000 dwt; 32,000 dwt and 58,000 dwt), rates were in the red, red, red. 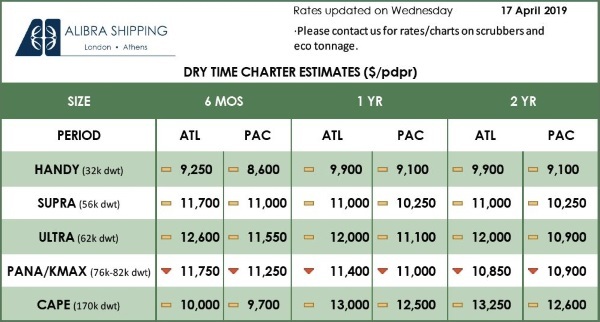 Supramaxes (58,000 dwt) were down from $8,500/day to $7,800 / day, Braemar reported. Fearnleys commented that the Supramax market was “flat and unexcited”. Vessels were being fixed as less than last-done in the Indonesia to China trade, said Braemar, which added that markets in Asia were “even less exciting” as charterers negotiated aggressively and tried to get low-cost deals. Fearnleys commented that the US Gulf had “limited fresh enquiry”, that the Black Sea was “not excited” but that Europe saw a better supply of fertilizer and, owing to mild weather, more cargoes coming out of the Baltic. “In summary, the market has continued the downward trend we have been observing,” Braemar concluded. In the smallest size, the Handysize (generally 20,000 dwt to 40,000 dwt) market started off negative, didn’t really do any better throughout the week and ended down. Southeast Asia and the south Australian coast are both oversupplied with vessels, Braemar says. Costs up and rates down equals… a positive development? Breakwaves Advisors note that the Baltic Dry Index (average) stands at 798 points, which is down 32.1 percent year-on-year. Looking forward, Breakwaves Advisors sees some reasons to be positive, particularly given current trends in dry bulk ship-scrapping. “A lot more ships need to be removed from service though in order to see some improvement in the supply/demand balance, but the trend is heading that way and we should expect even more tonnage to head to the scrapping beaches,” Breakwaves Advisors says. The advisory group suggests that scrapping rates of dry bulk ships is increasing because of the low freight rates and also because of “upcoming regulations,” which is a reference to the IMO 2020 low-sulfur rules. The general consensus seems to be the fuel costs are going to go up, and dramatically so. It is generally accepted in the industry that falling rates and increasing input costs tend to push the “old ladies” out of the dry bulk shipping market first. The old ladies go first because they have greater maintenance and crewing costs owing to their age. There is no set definition of an old lady, which will differ by segment. But ocean-going dry bulk ships of 15 years are definitely becoming elderly. Capesize dry bulk ships tend to be scrapped at about 20 to 23 years, which is eight to ten years before smaller (handysize) dry bulk ships. Incidentally, U.S. readers should take care not to be misled by the high age of the Great Lakes fleet. These ‘laker’ vessels will have a lifespan far in excess of ocean-going ships because they sail in freshwater which is much less corrosive than sea water.